My life seems to be all about endings and beginnings at the moment. I spent the eve of the start of my John S Knight Journalism Fellowship at Stanford last night wandering around downtown Palo Alto taking in the sights. 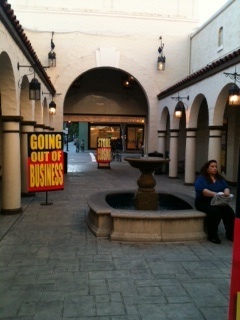 1) Borders Books: The massive bookstore in Palo Alto is having its closing down sale. I drifted about the space with its mostly empty bookcases (all of them for sale for about $50) feeling sort of depressed. Besides a couple of cookbooks and a volume of Noel Coward letters, there seemed to be only trashy self-improvement guides, CMAT primers and cheap romances left in the store. (I suppose I should be grateful that people in Palo Alto have good taste and bought the interesting stuff first. Assuming there was interesting stuff to be had in the first place.) The space is huge. I wonder if it will remain empty for long? It's hard to imagine what kind of business, besides another big chain store, would go in there. And I don't suppose a Walmart-like company would want to open its doors on University Avenue, where I imagine the real estate prices are sky high.